For equestrian professionals who also like to travel, this can be the ideal job! What is a Flying Groom? Flying grooms are qualified and experienced equestrian professionals who work as part of a highly specialised team in the business of air transport for horses. They may travel all over the world with top international equines. Why are HorsesTransported by Aeroplane? The main reasons for air transportation of horses are to import/export sports horses, like racehorses that are based in UK but qualify to run in other countries. Thoroughbred mares are sometimes flown to selected studs for mating with a particular stallion. Air transport is often the only practical way of transporting thoroughbred horses bought in other parts of this country, or from abroad. The Olympic games is an example of the accepted use of aeroplanes for transporting top equine athletes from around the world! What Does a Flying Groom Do? The professional flying groom takes over from the horse’s regular groom to travel with the horse. 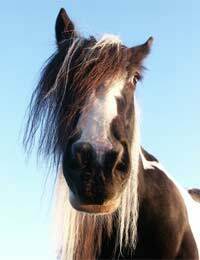 They are caring and experienced in handling nervous or distressed equine travellers. Flying grooms have veterinary training to deal with situations and emergencies specific to air travel with horses. Their calm, knowledgeable, handling of even the most nervous flyers helps the horse to have a journey which is both comfortable and stress-free. Although the majority of top sports horses are seasoned travellers, there is always a first time! The strange noises, smells and sensations of being at an airport could be frightening for any animal, which is why it’s so important to have professional grooms who are used to dealing with the unusual surroundings. Once all the paperwork has been approved the horses are weighed, to work out where and how the horses should be loaded onto the aircraft. In preparation for travelling, the horses wear leg protection in the form of travelling boots. They have a strong leather head collar on with two ropes attached. A sweat rug may also be needed. The flying groom will lead the horse, either into a special jet stall that is then moved by machine onto the aeroplane, or, up a long ramp direct to pre-secured stalls on board the aircraft. The flying groom stays with the horses throughout and sits close by for the entire flight to keep the horse calm and monitor its condition. The grooms perform ‘cabin crew’ duties of serving drinks and food during flights! Horses are usually fed hay while travelling, not hard feed, to avoid the risk of colic. They are regularly given water. Animals, like people, are prone to dehydration when flying because, although the cabin temperature is kept constant, it is air-conditioned. Horses may travel in single stalls (club class!) doubles, trebles or more (economy) depending on their size, value and temperament. Pre-flight checks are made by aircrew and equine team. It is essential that all the horse stalls are securely in place and the animals are settled. On some horse charter flights there may be as many as 60 horses travelling. In these cases, or when an owner wishes it, an equine veterinary surgeon will travel with the flying grooms. Equine qualifications are necessary for this work, to prove that the groom has attained a high level of proficiency in horse care and possesses dedication. It is advisable (maybe necessary) to be registered as a flying groom with the Animal Transport Association and DEFRA. Physical fitness is absolutely crucial to this role. The responsibility of caring for millions of pounds worth of bloodstock needs to be taken seriously. Work as a flying groom offers job satisfaction and the opportunity to travel worldwide with some of the crème de la crème of equestrianism. Experiences that may be gained are invaluable to the professional groom and committed horse lover. As specified in the article, one route is to study to be a groom in the first instance, please see National Careers link here. In order to become an equine flight attendent you would have to have a minimum of three years’ full-time experience with horses, plus you will have to have experience of accompanying horses during flights. You would also have to have experience of being able to conduct minor emergency treatment on the horse (s) you are accompanying. I suggest you speak to a careers adviser who will guide you on the most efficient route in to this career. Hello please can someone contact me on how to become a trainee flying groom with horses.I am very interested in a position if one comes up. I have experience in transporting horses for 14 years in the uk an some of Europe. look forward to hearing from someone soon many thanks graham. Hello I am 44 years of age an I am interested in becoming a flying groom. I transport horses for a living. I have been told you have to learn the safety rules on the aircrafts. I have transported horses for 14 years race horses polo poneys an some horse rescue jobs. I have a clean class one licence plus full cpc an digi card. I look forward to hearing from you soon. Hello. I am 51 years of age and have worked most of my life with both dressage and show jumping horses so i know quite a bit about their behavior. Now just seen a article in a magasine of John McGregor and would be very interested to find out more about how to go on about becoming a flying groom. Please give me some information. Gratefully Matti.